HMC819x Series RF Mixers offer image/sideband rejection of 25 dBc. Suitable for test and measurement and defense electronics applications, HMC819x Series RF Mixers are available in HMC8191, HMC8192 and HMC8192 models with SMT package. Supporting 2.5 to 42 GHz spectrum, units feature 35 dB or greater for LO to RF and LO to IF isolation and greater than 20 dB RF to IF isolation. 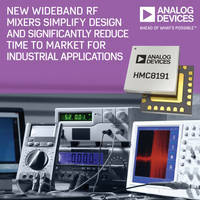 Analog Devices, Inc. (ADI) today introduced a series of wideband, passive, in-phase quadrature RF mixers. Supporting the entire 2.5 to 42 GHz spectrum, the HMC819x mixers provide significant benefits compared to alternative discrete options available today and are ideal solutions for industrial applications such as test and measurement and defense electronics that require wideband support. Over 10 discrete components would be required to cover this same frequency range, as compared to what can be achieved with ADI’s three new devices without any compromise in performance. ADI’s HMC819x mixers are the industry’s only wideband solutions available in a standard SMT package, allowing them to be integrated efficiently in order to decrease overall design time and risk, while speeding time to market. The HMC819x series’ RF and LO bandwidth of 2.5 to 42 GHz along with wide IF bandwidth enable military or test and measurement applications to simplify design implementation while still maintaining superb RF performance. The series achieves exceptional isolation on the order of 35 dB or greater for both LO to RF and LO to IF isolation and greater than 20 dB of RF to IF isolation. The inherent I/Q architecture of the mixers accomplishes image/sideband rejection of 25 dBc or greater without the use of expensive external filtering thus overall reducing bill of materials cost. Input IP3 greater than 20 dBm is realized over the wide bandwidth while maintaining low conversion loss and high dynamic range. Well-matched LO driver amplifiers have been listed to drive the LO port of each mixer with low input power.